Welcome to Amber’s Animal Outreach! In 2014, when Amber turned 13 years old, she asked if she could open her own non-profit 501c3 organization. Her wish was granted and her organization was established and named “Amber’s Animal Outreach.” Through Amber’s hard work, dedication and fundraising, she has helped find food and homes for these voiceless souls. Her goal is to strive for the welfare of all dogs in any possible way to avoid unnecessary euthanization. 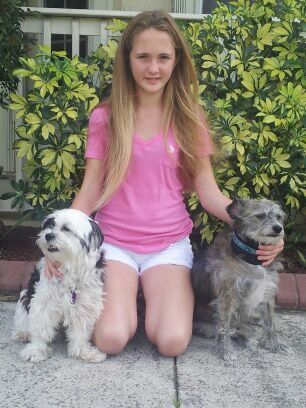 She has been written articles since the age of 7 years old and continues to help dogs in any way she can. Amber has been involved with many dog rescues in the area, raising $1000’s for dogs in need for hip knee surgery, knee surgery, even burn victims.